Darien High School’s Susannah Ropp shoots and scores during the CIAC class L championship game against Fairfield Warde High School played at Jonathan Law High School, Milford, Conn. Saturday, June 11, 2016. MILFORD — When the buzzer sounded concluding Saturday’s Class L Girls Lacrosse Tournament final, a championship legacy was completed by the Darien High School seniors — a group that doesn’t know what it’s like to end a season without championship medals around their necks. The Blue Wave seniors needed one more win to put the exclamation mark on four years of greatness. And after 50 minutes of their usual impressive play, their final triumph was celebrated and will no doubt, be remembered. 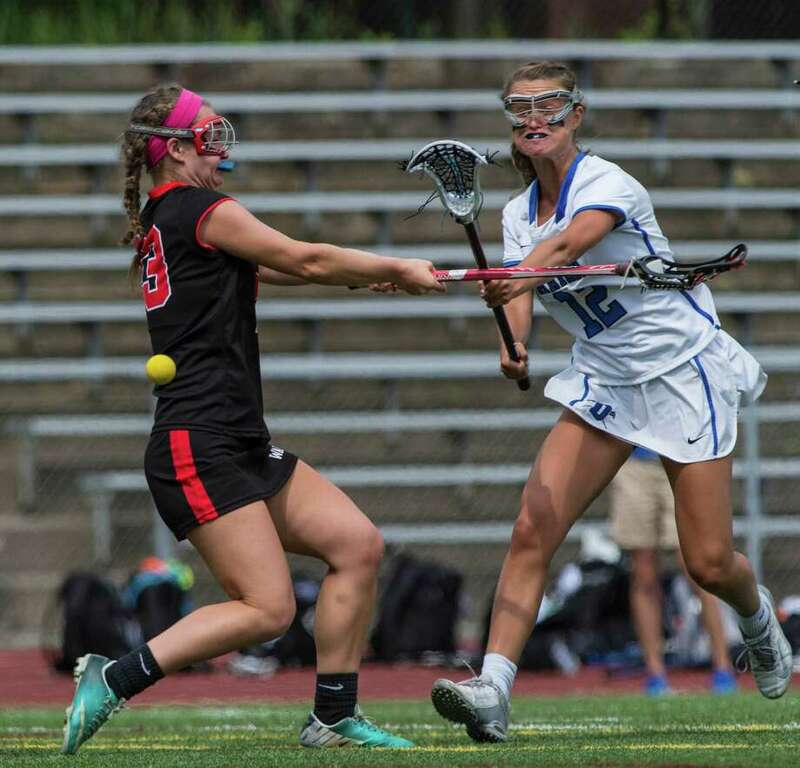 Top-seeded Darien continued its reign of supremacy, winning the CIAC Class L Tournament championship for the fourth consecutive season with a convincing 12-5 victory over sixth-seeded Fairfield Warde Saturday at Jonathan Law High School. How’s this for leaving a legacy? Each of the 10 seniors Darien’s squad has been a part of four state and FCIAC title-winning teams. Senior attack Susannah Ropp scored a team-high four goals, while junior midfielder Laura Murphy recorded a hat trick for the Blue Wave, who entered halftime with a 9-2 lead. Kirby and Kaeleigh Morrill scored two goals apiece for Darien (21-1-1). The four-time defending state champions capped the season by winning their last 13 games and were unbeaten against Connecticut competition. The Mustangs, who made their first appearance in the state championship game, were paced by sophomore midfielder Libby McKenna’s four goals. Murphy scored the game’s first goal, scoring off a pass from behind the net by junior Anna Stein 3 minutes, 8 seconds into the opening half. Cutting to the goal, Ropp snapped a shot from close in past Warde senior goalie Rebekah Snitkoff, making it 2-0 at the 21:17 mark of the first half. McKenna went low with her shot with 20:23 left to go in the first half, bringing the Mustangs to within 2-1. But after Darien won the ensuing draw, Kirby tallied in transition, putting the top-seeded team in front, 3-1, with 20:02 to play in the opening half. The elusive McKenna cut Darien’s lead to 3-2, going top shelf with her shot from 10 yards out with 18:32 remaining in the first half. However, the Blue Wave seized the momentum the rest of the half, going on a 6-0 run to open a comfortable 9-2 advantage. Ropp and senior midfielder Katie Cronin each converted free position attempts, Kirby scored off a set play, Murphy buried her free position shot and Morrill picked up a ground ball and tallied as the buzzer sounded, making it 9-2 at intermission. Behind junior goalie Carly Schoudel (eight saves), the Blue Wave were strong defensively throughout. Budd, junior Annie Wright and junior Logan Book helped lead the way defensively for the Blue Wave, who focused on slowing down McKenna and junior midfielder Courtney Scheetz. McKenna scored off a spin move and sophomore attack Olivia Seymour tallied on an 8-meter shot, slicing Darien’s edge to 9-4 seven minutes into the second half. Yet that’s the closest the Mustangs got. Davis believes the experience will help his squad. “Our program has a lot of pride and this gives us some more pride and motivation,” he said. Darien, which posted a 12-4 win over Warde in the regular season, held a 23-19 shots-on-goal advantage and forced 14 turnovers. Warde, which received seven saves from Snitkoff, created 10 turnovers. Scoring: FW — Libby McKenna 4 g; Olivia Seymour 1 g; D — Susannah Ropp 4 g, 1 a; Laura Murphy 3 g; Chandler Kirby 2 g; Kaeleigh Morrill 2 g; Katie Cronin 1 g; Goalies: FW — Rebekah Snitkoff (7 saves); D — Carly Schoudel (8 saves). Records: Darien 21-1-1; Warde 14-6.